In this recipe we have given our Cumberland Sausages the Scandi twist. Pairing them with Celeriac Cheddar, a Celeriac Fondant and wild mushrooms all brought together with the peppery notes of watercress and Beurre Noisette with capers. Place the celeriac rounds in a deep baking tray, pour in the vegetable stock, place a small knob of butter on each round. 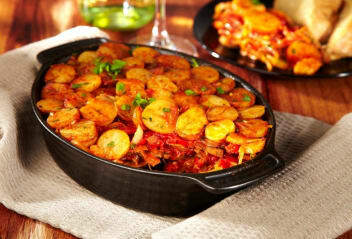 Cover with foil then place in the oven and cook for 1 hour, topping up with more stock if necessary. Mix all of the ingredients together for the yeast roasted sausages except the oil. Brush the oil onto the sausages and coat them in the yeast. Place on a lightly greased baking tray and cook for 18-20 minutes. To make the celeriac puree, place the celeriac in a pan and cover with cold water. Bring to the boil then simmer for 15-20 minutes until soft. 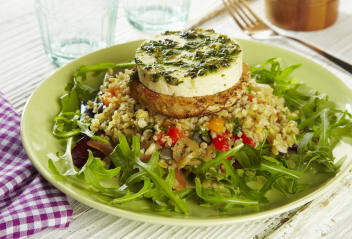 Drain and blitz in a food processor with the cheese and salt and pepper to make a smooth puree. To make the Beurre Noisette, melt the butter in a saute pan and cook until slightly golden but not burnt in colour. Add the lemon juice, capers, salt and pepper and remove from the heat until required. Lightly saute the mushrooms in the vegetable oil until softened. Bring a small pan of water to the boil then reduce the heat to a simmer. Very carefully drop in the egg yolks one by one and cook for 1-2 minutes until beginning to set. Gently remove from the water. Reheat the beurre noisette if necessary. 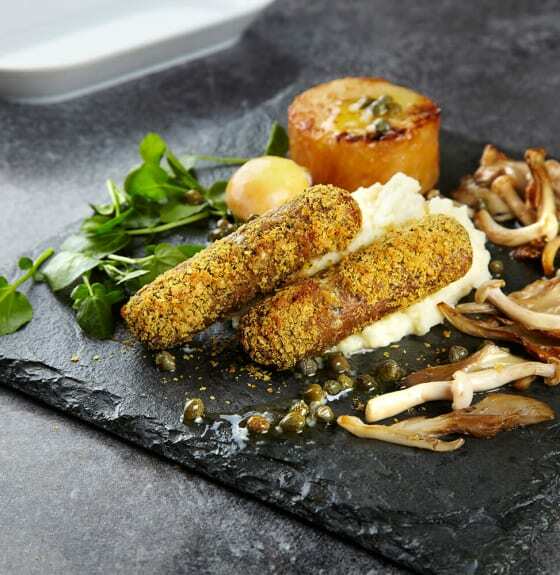 Arrange the celeriac puree and yeast roasted sausages on the plate. Add the mushrooms, fondant celeriac and drizzle the sauce over. Scatter with watercress leaves. This dish takes its inspiration from a classic Spanish dish and combines smoky paprika with sherry glazed sausages. 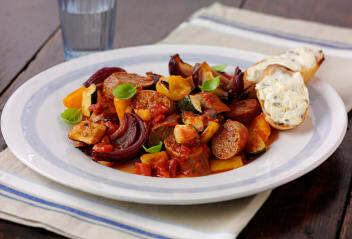 Smarten up your sausages with this healthy midweek meal containing Cauldron Cumberland or Lincolnshire Sausages.